This is my new favourite. 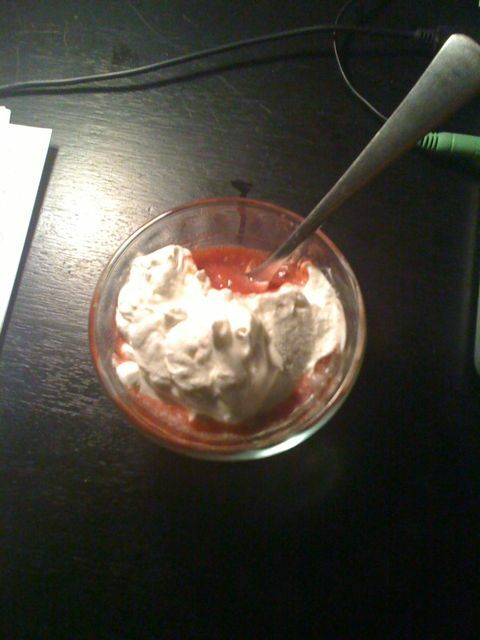 It’s a homemade strawberry sorbet with whipped real cream sweetened with stevia on top. Ryan and I love love love it! I made the sorbet on Wednesday, chilled it overnight. We had some last night and tonight. Sooo good. I got the recipe from the Raw Epicureans over at rawepicurean.net. They had a post a few days ago for a Cinnamon Spiced Strawberry Sorbet. I didn’t have any cinnamon but I used allspice and it worked just fine. Also, I used mango juice instead of orange juice, since that’s what I had. Finally, I ran out of agave, so I fill up the measuring spoon with honey. I don’t have an ice cream machine so I just followed the instructions for freezing it. I re-used an ice cream container. Having it with the real whipped cream is a super combination. It tastes rich, refreshing, and rare!